Freshman Michaela Kroon has been nominated for Athlete of the Week by The Courier News! 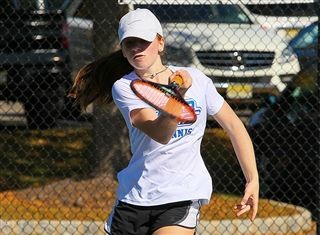 Kroon is coming off a phenomenal start to the tennis season, winning both of her matches against Hunterdon Central and 15th-ranked Pingry to help the Knights to a 2-0 start. Voting for Athlete of the Week closes on Wednesday, September 12, at 7:00pm. Click here to vote for Michaela.